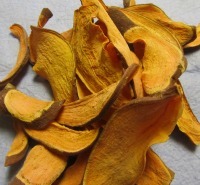 I've been making dehydrated sweet potato dog treats for my pooches for a long time. 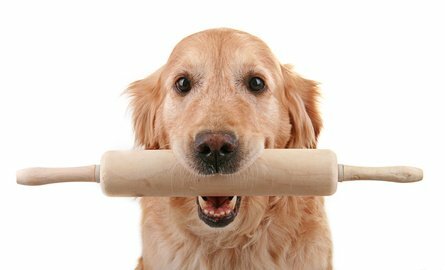 With there being so many issues with store bought dog treats containing unhealthy levels of antibiotics or salmonella poisoning, I would seriously encourage you to begin making your own dog treats. Then you know what your dog is eating for sure! AND Sweet Potatoes are an excellence source of c, b-complex, iron, and phosphorus, which all are great for your dogs immune system along with other benefits. Quick Trick for easy slicing: Put the washed sweet potato in the microwave for a couple of minutes to soften it just a bit. This will make it easier to slice. Otherwise trying to cut that darn hard potato could result in slicing other things like your fingers or hands. Really I'm serious! They are stinking hard! AND roll! Take the precooked Sweet Potato lay it down lengthwise on a cutting board and cut off one side close to the edge of the fattest part. This will create a flat stable surface and make cutting easier so it won't roll all over the place. Lay the potato on this flat cut side and begin cutting at one end of the potato. Cut each slice 1/4" thick. Your not cutting lengthwise, your cutting from end to end. 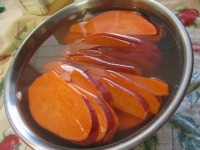 I submerge the slices in cold water for about 1-2 minutes just to blanch them a bit to help keep their color. Remove with a slotted spoon to cooking sheet. Place the sweet potato slices on your baking sheet. I bake for about 3 hrs., turning the slices 1/2 way thru. This will give you a soft, but chewy dog treat. For a crunchier treat, cook an additional 20-30 minutes depending on how hot your oven cooks. Just check them around 20 minutes. Remove from the oven and place on a wire rack to cool. Your sweet potato dog treats me seem a little chewy when you first take them out. Let them cool to see if you like the texture. If not put them back in the oven until desired texture. Prepare your sweet potatoes the same as above and load into a dehydrator, leaving space in between slices to make cooking even. Set your machine as directed in your book. I typically dehydrate my sweet potato dog treats approximately 10-12 hours. I like to have them a bit soft when done because they will harden once cooled and refrigerated. 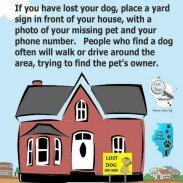 You may need to test a batch or two until you get the texture where you and your puppy dog like them. Let slices cool on dehydrator racks and then place into a zip lock and keep in the refrigerator up to 2 weeks. 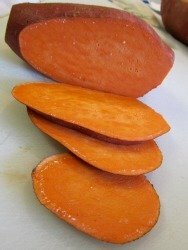 With either cooking methods, the color that your dehydrated sweet potato dog treats turn out will vary. The cold blanching always keep ours a nice color. Don't worry if they don't look like the picture on this page. Your dogs won't care, they just wanna eat those Sweet Potato Dog Treats!